It is time to join Christina‘s Garden Bloggers Foliage Day (GBFD), a monthly tribute to foliage. Euphorbia ‘Blackbird’ has been a rewarding addition to the garden this year and GBFD would not be complete without including it. The tips have deepened to a captivating, velvety red. 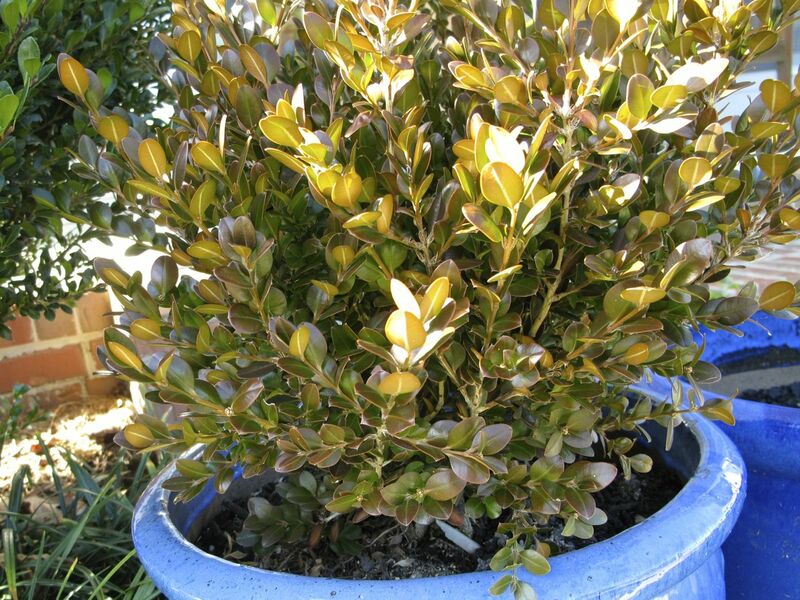 The leaves of this Wintergreen boxwood have taken on a bronze hue for winter. 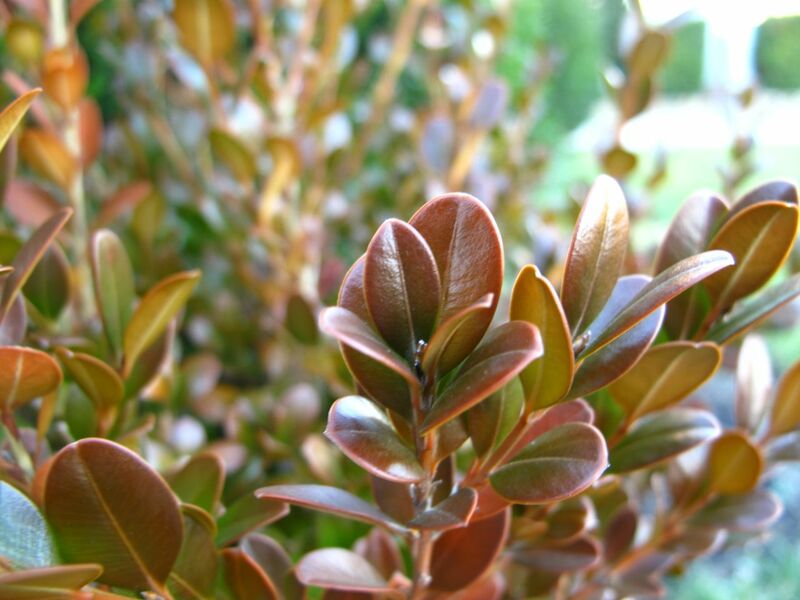 This bronzing effect is a normal coloration change for this shrub, but it seems more noticeable this year. 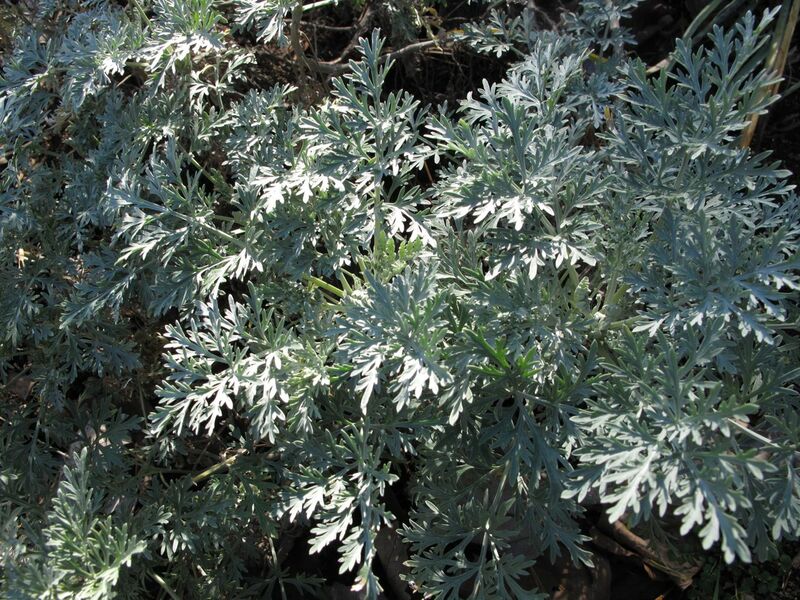 The bluish-gray leaves of Artemisia ‘Powis Castle’ (Wormwood) are unaffected so far by the cold. 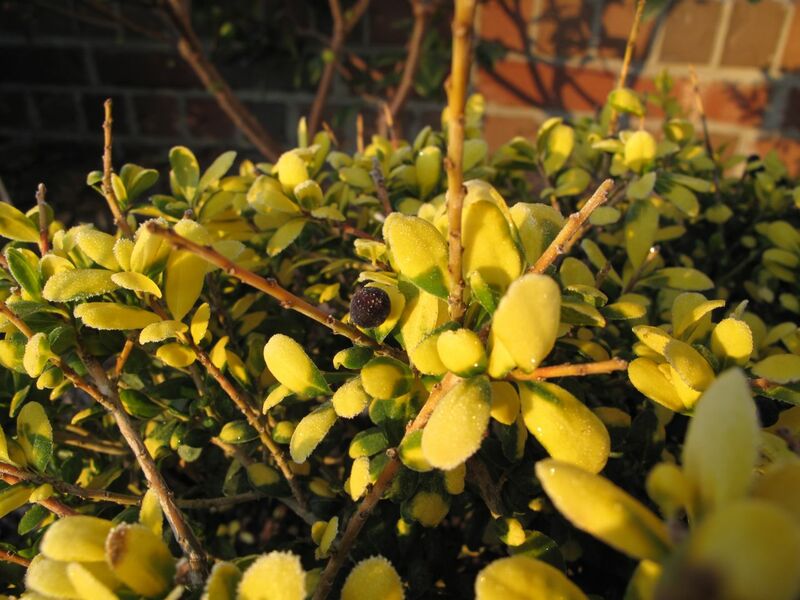 This Ilex crenatea ‘Drops of Gold’ (Japanese Holly) was planted in front of the house in October. It lost some of its gold leaves from the stem tips a few weeks ago, but the plant seems to have stabilized now. It formed attractive, black berries, but only a few. Mounds of Lychnis coronaria (Rose Campion) catch late afternoon sunlight along the Southern side path. A pot of mixed sedum adds texture and interest to a corner just inside the garden gate. 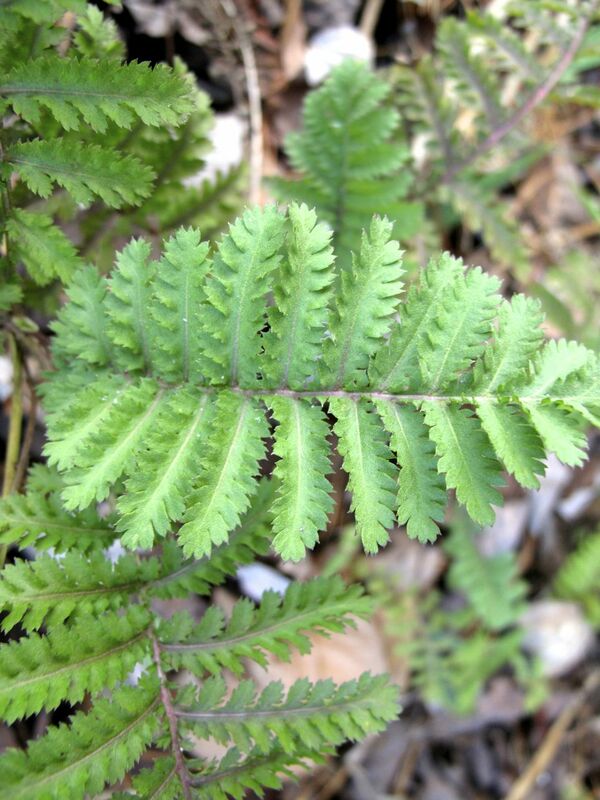 Fern-like leaves of Tanacetum vulgare (Tansy) offer surprisingly fresh greenery to the southwest corner. Daffodils already are sending up leaves beneath the brittle canes of Lantana camara (Common lantana). The lantana will be pruned back hard in early spring. 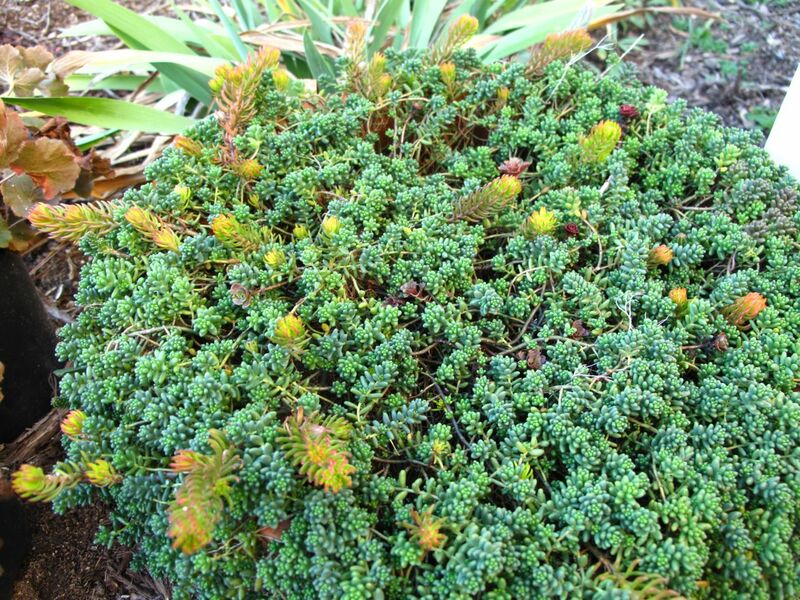 This cheerful little mound of green is Iberis Sempervirens. 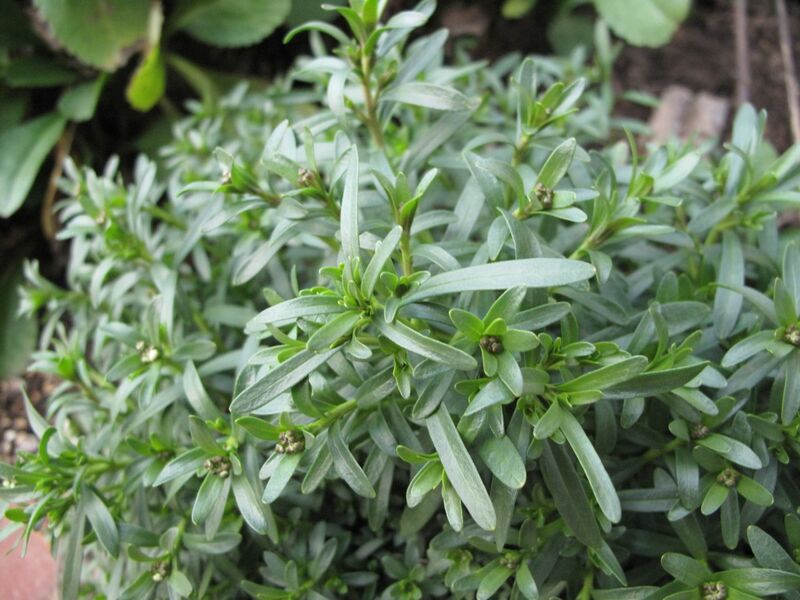 Although Iberis died out in the meditation circle this summer, it is growing in several other spots around the garden. This one may be blooming soon. 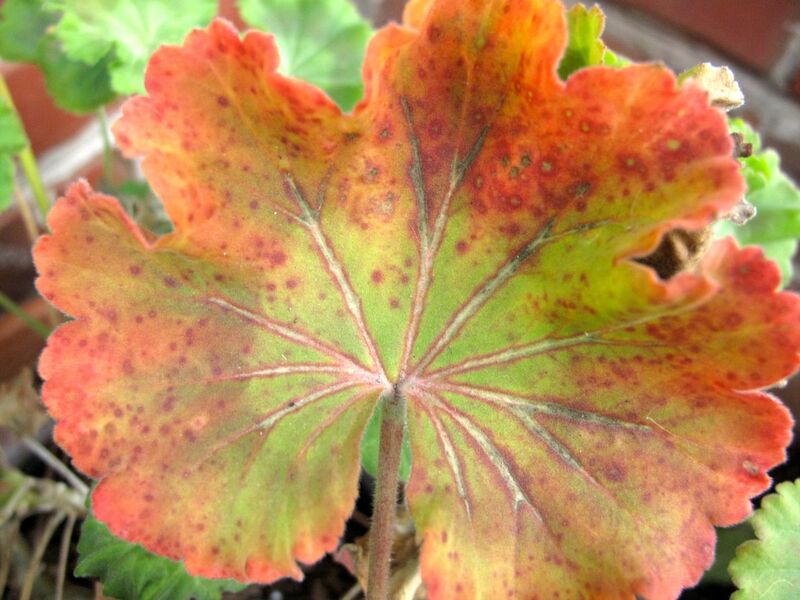 This potted geranium’s leaf is punctuated with tangerine edges and strongly outlined veins. Thanks to Christina of Creating My Own Garden of the Hesperides for hosting Garden Bloggers Foliage Day (GBFD) each month. Check out her foliage observations and those of other GBFD participants. This entry was posted in garden and tagged artemisia, daffodil, euphorbia, GBFD, Ilex crenatea 'Drops of Gold' (Japanese Holly), lychnis coronaria, Mixed Sedum, tansy, Wintergreen boxwood on December 22, 2012 by pbmgarden. You have such a lot of beautiful foliage still and so colourful too! 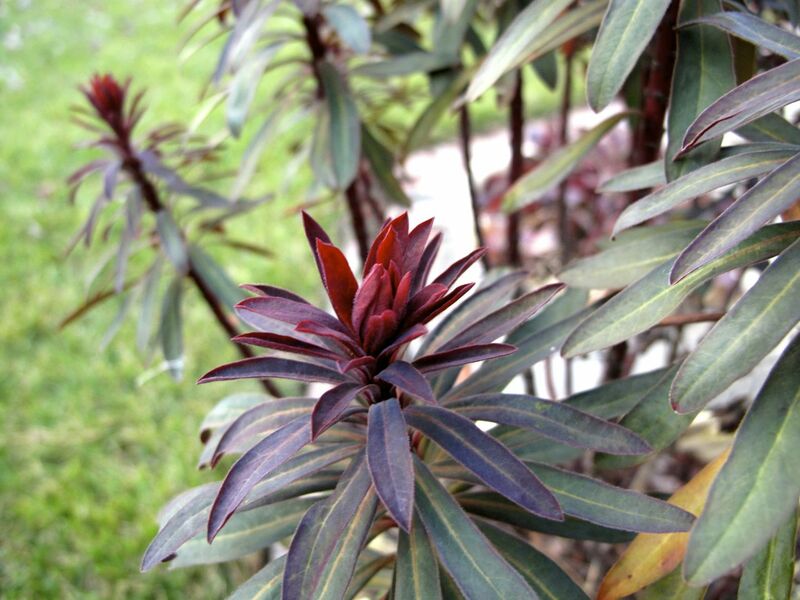 Winter certainly makes us appreciate all the foliage in the garden when there aren’t many flowers to distract us. Happy Christmas to you and your family! Thanks Pauline. 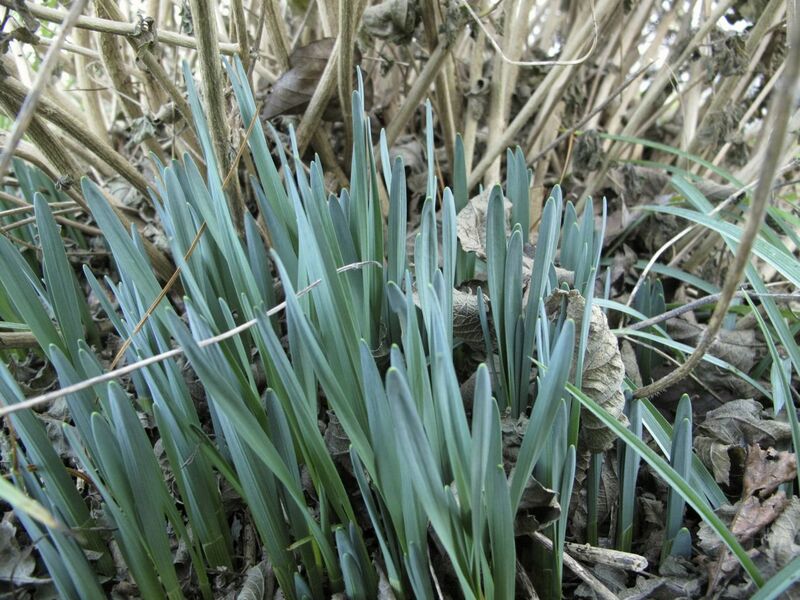 Winter has revealed many opportunities for improving my garden, including concentrating more on how the foliage of different plants can work together. Something to think about for the new year. Merry Christmas and peace to you. You’ve got a wonderful mix of shapes and colours – who needs flowers with all that beautiful foliage! I especially like the Euphorbia. 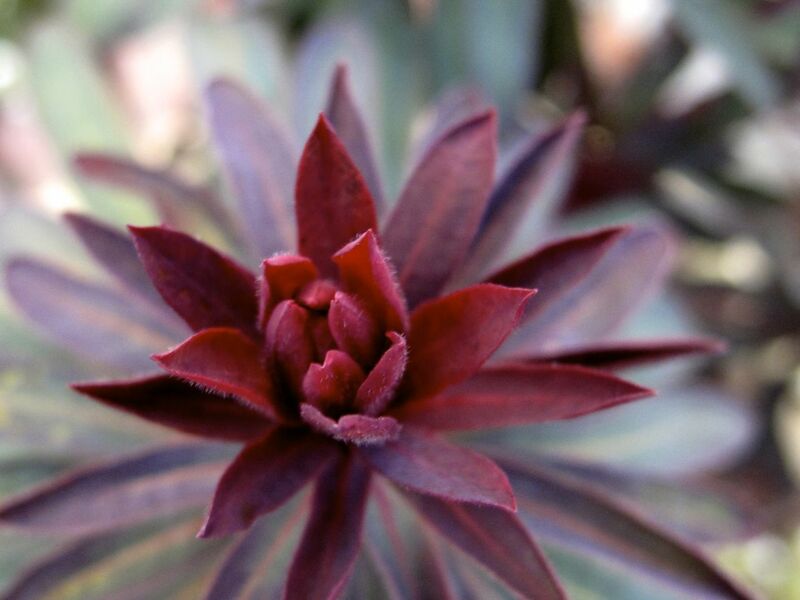 The Euphorbia looks Christmasy, doesn’t it? 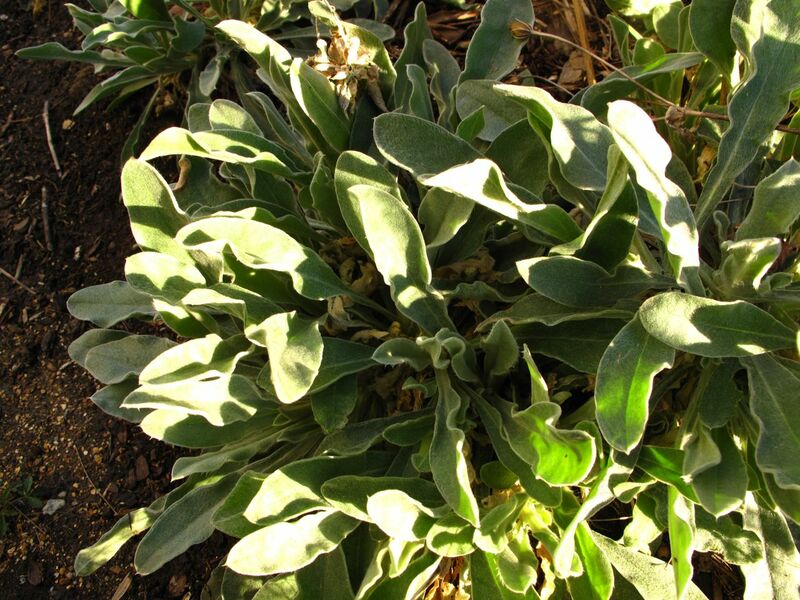 It would be nice to have a mass planting of some of these plants that have showy foliage, but for now it’s really just one plant here and one plant there. That Euphorbia is amazing. Wouldn’t it be wonderful in an all-red border? Yes, such a good idea! Wow! Nice pictures! I like that box, especially planted in that blue pot, it looks perfect! And I am soooooooo envious of your euphorbia, I can’t grow large spurge in this garden successfully and I still haven’t understand why! Thanks Alberto! Blue pots are good. Euphorbia is new to me this year and it has done fine living in a big pot. Wish I had put it in the ground though.